Hurricane Recovery – As St. Johns County continues hurricane recovery efforts, North Beach driving has been temporarily suspended. Once recreational access has been restored, we will update this page to reflect current conditions. Thank you in advance for your patience during this process. 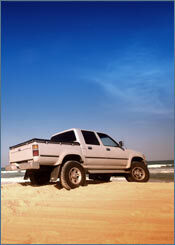 Vehicle Inspection Appointments – Required to receive North Beach Permit, are only available on Mondays. Please call (904) 209-0619 to schedule your appointment. To ensure appointment availability, please schedule your inspection two business days in advance. North beach drivers must obtain a permit by completing Protected Species Training (below). Approved drivers are allowed access at Surfside access ramp. The general public is not permitted to enter the beach at this location. Permits are free. Training must be completed annually. Current annual pass affixed to passenger side of windshield, 4x4 or all-wheel drive vehicle (no ATVs, motorcycles, etc.) Annual passes can be purchased at any toll booth from March 1 – Labor Day. Preseason beach passes can be purchased at the Tax Collector’s offices, St. Johns County Fishing Pier, and the Recreation & Parks Department. 2. Quiz Complete Quiz at end of Training. 4. Come In Vehicle Inspection Appointments – Are only available on Mondays. Please call (904) 209-0619 to schedule your appointment. Bring your application and arrive in the vehicle you are obtaining a permit for with an annual beach pass affixed to dashboard. 5. Receive Permit You're ready to go. Need Technical Assistance? Adobe Flash Player is required to view and complete the training. Acrobat Reader is required to view and/or complete the application on your computer. For more information or to arrange a group workshop, please contact: Jade O'Neill, (904) 209-0619.